For over 30 years our valued customers have asked for AIR DECK to convey and accumulate everything from candy, caps and cartons to pouches, bags and bottles. 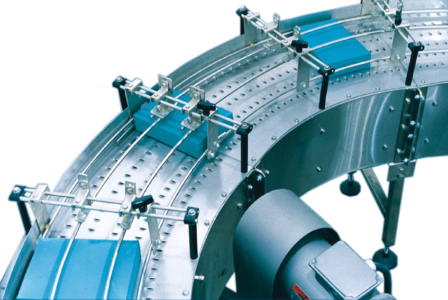 AIR DECK Conveyor with its accumulation capabilities during downstream equipment down-time, provides cost savings and value through low maintenance and the reduction of waste. Combined with a complete set of control components, Dillin Engineered Systems has made a science out of AIR DECK applications. Offering an average of 400FPM of product throughput, Dillin’s exclusive AIR DECK technology conveys at more than twice the speed of conventional means. It handles these high speeds with little or no wear to the equipment and requires little maintenance. Riding on a cushion of air, your product is conveyed and accumulated safely with minimal graphics wear. AIR DECK’s low maintenance, high throughput and higher capacity features make it a competitive choice for reducing your total cost of ownership. Dillin’s exclusive AIR DECK technology can be customized to accumulate virtually any package type with very little friction. Dillin’s exclusive AIR DECK technology can be customized to convey in mass flow virtually any plastic or metal container type with very little friction. AIR DECK conveys at more than twice the speed of conventional means. It handles these high speeds with little or no wear to the equipment and requires little maintenance. Riding on a cushion of air, your product is conveyed safely.